Spring clean your grooming routine with these grooming essentials from men-u. The Ultimate Shave Kit contains everything you need for the ultimate shave The Shave Creme, Healthy Facial Wash, Matt Skin Refresh Gel, Gel and Facial Moisturiser Lift, form a revolutionary four step approach to achieving healthy skin. While the registered PRO BLACK shaving brush design is like nothing else on the market. It is accompanied by the ultra-concentrate men-u, packed with anti-friction lubricants including silicone and moisturisers. To provide optimum slip for the razor blade so it won't dry the skin. 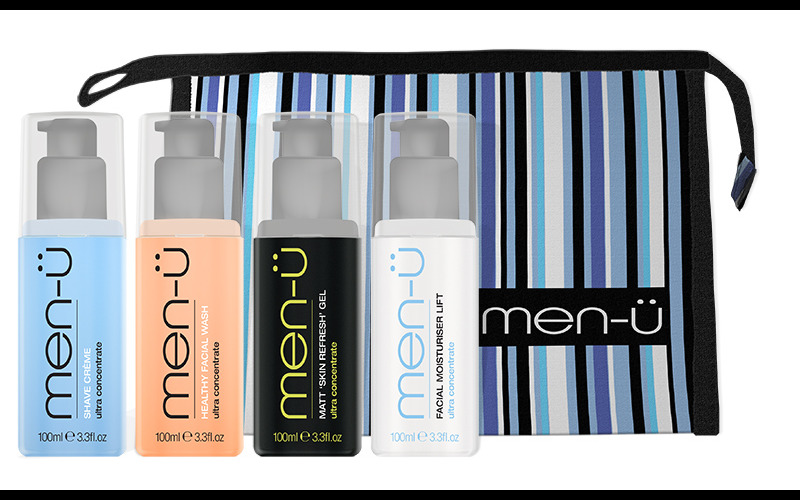 The men-u Travel Kit fits easily into your gym kit to ensure you enjoy a well - earned invigorative shower experience after your work out. The high percentage of active ingredients in the Black Pepper & Bergamot Shower Gel means a small amount of product will go a long way - the Shower Gel can last up to four times as long as a standard gel its size, so the 500ml shower tank is equivalent to 2 litres and can last one person up to six months!